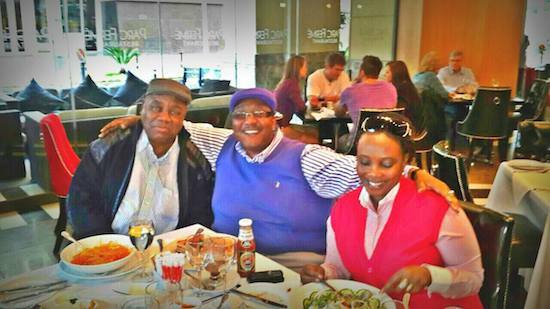 My wife Chama and I had late lunch with the our former Republican President Mr. Rupiah B. Banda after we visited his dear Wife Mrs. Thandiwe Banda who has not been feeling too well. Let us continue praying for the former President and our former Firstlady for good health and longevity of life. They served their country to the best of their abilities. Taking this opportunity, let me say that as President, RB could have made his mistakes like everyone else. But if there is a sin he committed in the eyes of some people, it was to demand that K34 billion Kwacha owed to Development Bank of Zambia (DBZ) is paid back and every right thinking Zambian knows he was right. Demanding for repayment of K34billion is a matter of national interest. If we do not respect our leaders, no one else will. We will disagree with them but they deserve our respect.To this day, I still have my respect for President Michael Sata. This should be our new culture, to respect our leaders. Today, I encourage Zambians to move away from seeds of bitterness planted by well known sections of our society to hate and disrespect those who have served as Presidents to the point of hating and insulting them even in their graves. Bitterness and hatred has never built any strong nation. The Educated and the Elite of Zambia at the Service of the Common Good!